Yes, I am sitting in the airport at Newport News, Virginia awaiting my flight back to good ole' Louisiana. I have been here the past 4 days visiting with my Mom's family, mainly, my Aunt. Aunt Wanda was the oldest sibling of my Mom's family and is the only one surviving at the ripe old age of 87. She is really an amazing person, still leads a very active life and I can only hope that I will be as blessed with good health as she has been. It was really good to visit with her and share a lot of memories of Mom. I also got to see several cousins that I have not seen in many years and made some very sweet memories to add to my collections. I will definitely post pictures on a later blog. I did not know if I was going to be able to make the trip this time last week. I have had my ticket for 2 months, but one week ago Tommy was stricken with a gall bladder attack that almost took him out. It was just awful to see him in such pain and not be able to do something for him immediately. We spent time in the ER, then saw two Drs. and surgery was scheduled for last Tuesday. Since he had gallstones, the Drs. said it definitely needed to come out before it caused him some serious troubles. Well, we knew we didn't want that and moved right on with the Drs. advice. He had the surgery on Tuesday around 1:15, was back in recovery by 2:00 and holding a very good conversation with me and the nurses and was in very little discomfort. It was unbelieveable to me that he could go through such surgery (that not so long ago was a major surgery) and appear as though he had just a minor stratch. We were discharged around 5:00 and headed towards home. We discussed my trip and Tommy really wanted me to go ahead with my plans. The Drs. told him to just take it easy, but he didn't have any real restrictions. So, since it would be difficult for me to reschedule my trip, I decided that I would go forth with my plans. I've talked with him every day and it appears that he has done wonderfully well. I have had such a great time but I am definitely ready to be home. As I always say, "it's good to go, but it's even better to get home." There's just no place like it. I have lots to do in preparation for Tommy's 35th anniversary Open House at the office this Thursday. So, I will get with it and pull that together and be on to the next items on my agenda. A happy week to all of you! I've was thinking just yesterday about the difference a day can make in our lives. We have all had day(s) that we just could not believe all that took place. Life can be going along as wonderful as can be, and then all of a sudden, it can take a downward spiral. Or, it can be taking that downward spiral and suddenly that spiral goes upwards. I do not know how someone without the Lord as their Savior deals with those days. I have always been able to count on Him to see me through those times and it is such an assurance to me as I go through this life. I do not have to make it on my own (thank goodness), He goes before me each step of the way. Of course, in thinking back over this past year and all the upward and downward spirals my life has taken, I have felt His hand over me in unbelievable ways. If someone had told me this time last year that I would be motherless this time this year, I would never have believed it. But, in looking back, the Lord was preparing me (without my knowledge) for that time. Her untimely death has given me new insight to each new day and to cherish each and every one of them. 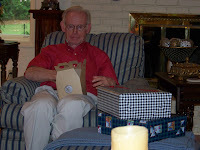 We will celebrate two very important men in my life tomorrow, my husband and Dad. Both deserve much celebration. I am so thankful for my Dad and the very positive influence he has had and continues to have in my life. He is a very special man and I love him dearly. I am thankful that the Lord blessed me with a husband that takes his role as a Father very seriously and has two children that love him dearly as a result. Yes, God has been good to me and to my children. May you find yourself celebrating life each new day! 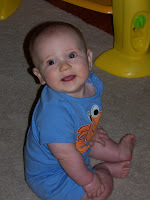 When I blogged on Sunday, I felt sure that we were on the downhill slide of "the bug" that had hit and Bridget and Clancy would be able to go forth with their plans of leaving yesterday morning. Well, such was not the case. Bridget got up around 5:30AM yesterday morning, woke Clancy up and brought him to me so I could feed him his breakfast and give him his bottle and he would be "ready for the road." He was pretty fuzzy when he woke up, but afterall, he wasn't ready to get up, so he had every right to be fuzzy. Or, so we thought! He ate his oatmeal very willingly and took about 4-5 ounces of formula. After taking his bottle he just leaned his little head back in my arms and closed his eyes. Certainly not normal for him. Again, we blamed it on the fact that he was probably still sleepy. Bridget came over to feel of him and about that time he began throwing up. I had a cloth diaper in my hand and prompty placed it in front of him and it received the bulk of the mess. Thank goodness! After we got him cleaned up, Bridget and I began to cry. She wanted to get home so badly and I understood how she felt. I told her that we could surely come up with a plan to get her home yesterday. And, we did! Windy drove Bridget's vehicle and Bridget rode in the back with Clancy and I followed them in my vehicle. Clint's Mom, Barbara, met us in Jefferson, Texas around 11:30 and followed Bridget on from there. Even though there was no one in the car with her and Clancy, she had someone that could stop with her and be with her in case anything happened. Clancy threw up 3 more times before we left, but was fine the rest of the day. He took a little Gatorade on and off most of their trip and they finally pulled into their house around 9:00 last night. We were relived to know they were safely home and they were relieved just to be home. Clint was so glad to see them. Bridget took Clancy to his Pediatrician this morning and he checked out just fine. Clancy has not wanted to eat or drink much today and that has been rather distrubing to Bridget, but I imagine that he'll have his appetite back in another day or so. It was so good to have Bridget and Clancy with us last week, everyday is a new adventure with an 8 month old and we enjoyed sharing in those adventures. 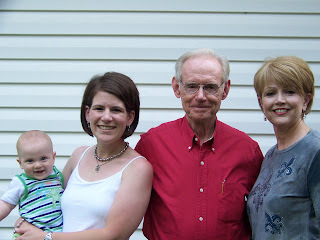 We had some great family times when Daddy, Windy and Brandon joined us. I seemed to be in perpetual motion the entire time, either cooking, doing laundry or keeping up with Clancy. I was reminded once again of why they are called Grandchildren. They are indeed Grand and we can enjoy them for a time but know that they are not our full responsibility. How much "grander" can it get? Bridget is doing a great job mothering and now completely understands "a Mother's love." It's just something you cannot explain, one has to experience it and she has and it is so sweet to watch. I spent today cleaning, doing laundry, folding clothes and ironing. Also had to go buy groceries and do a few other errands. I think I'm almost "back on track" and it feels good. It has been over a week since I last posted, but there has been no time for blogging, I assure you. This picture shows what I have been doing some of the time. Rocking sweet Clancy. It is a rare privilege anymore to get to rock him. So, when he is willing, I am able. We arrived back in Bastrop last Sunday afternoon with Bridget and Clancy. It was a good trip, but we were all pretty weary once we got home. It has been a fun week. The following pictures will capture some of what this week has been about. 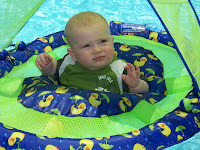 Clancy enjoyed swimming for the first time with his Mommy and Aunt Rue Rue. He absolutely loved it! They make such neat little gadgets to put them in to shield them from the sun. Just too many cute options available for little ones today. We enjoyed celebrating Bridget's 30th birthday (a little early, her birthday is July 3) and Father's Day on Friday evening. I grilled steak, fixed potatoes, salad and bread for dinner and we all enjoyed it. 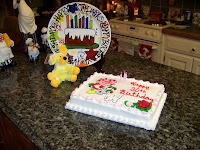 Of course, the birthday cake was the "hit" of the evening. Everything had gone real well until yesterday afternoon. Clancy had not wanted to eat most of the day but appeared to be fine so we didn't worry a lot about him. Then, out of the blue, he decided to throw up yesterday afternoon and it was obvious that he wasn't feeling well. WE decided to take him to the Dr. since it was late evening and we were so glad we did. He had an ear infection. Things got calmed down and Clancy had a good night, but his Poppa didn't. Tommy has not been sick with a stomach virus in YEARS, but he was last night and continues to feel rough today. He is getting better and hopefully by later this evening he will enter the "land of the living." Bridget and I are caring for the "sick and afflicted" and enjoying just having fun this afternoon. We are both still in our PJ's, and NO makeup. It really feels good! I promise to be more attentive to my blog. I miss it when I don't get to blog at least a couple of times a week. A happy week to everyone! On this day 38th years ago, Tommy and I became husband and wife. It was on a Sunday and we were married at 2:00 that afternoon at the Old Forest Road Baptist Church in Lynchburg, Virginia. The ceremony was performed by my Dad and he made it such a personal and worshipful service. In some ways, it seems it was just yesterday, in other ways, it seems a lifetime ago. Of course, I was only 18 years old. I did turn 19 seven weeks later, but nonetheless, I was only 18. Thank goodness, Tommy is 5 1/2 years older than me and definitely was much wiser than me at that time. If he had not been, our marriage would never have survived. I don't know that any couple has any idea what they are really getting into when they marry, but I do know that Tommy and I made the commitment for a lifetime. That was the way our parents raised us, there was no other option! So, with the prayers and support of our parents, here we are. 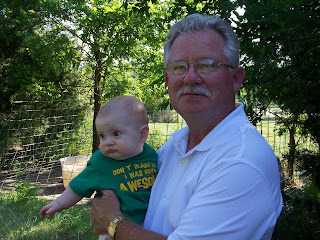 When we arrived at our little humble abode in Bastrop, it hit me that I had left behind everything familiar to me . My Mom was 1000 miles away!!! And, there was no internet, no cell phone and since we had no money, there were hardly any "old fashioned" phone calls. But, there was a lot of "snail mail." Tommy was so patient as night after night I would cry myself to sleep due to homesickness. Mom's letters were always encouraging and so were the few phone calls that we were privileged to share. Month by month, I adjusted, made new friends and began my journey, called marriage. The greatest credit that we can give to these 38 years is the abiding guidance of our Lord and Savior. No, we have not always sought His leadership, nor have we always followed it. But, we both share the same commitment in striving to put Him first and I must say have come a very long way from where we were 38 years ago. I do not know how any couple can ever survive without a joint commitment to Him. Trying to make it on your own is just not possible and we are so grateful for the growth we have experienced through Him during our marriage. We have walked through some more than wonderful times in these years, but we also walked through some very "dark" days. The loss of 3 parents and health issues with both of our children have been the darkest. But, through it all we have felt God's peace and comfort. We look forward to the coming years and thank Him for these past. Yes, God is good, all the time God is good! 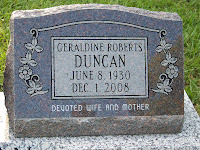 Mom’s monument was placed last week and I had been looking forward to that day. I had only been to the cemetery one time since her death and just looking at the ground didn’t bring me any satisfaction at all. I wanted something there to say who this precious lady was, something tangible that I could look at and remember my Mom. My Dad took care of choosing the monument and it was truly a “labor of love” for him. He looked and searched until he found exactly what he wanted. Dad has always had the “gift” of design and the monument is certainly a reflection of that. Of course, he not only designed it for Mom but for himself as well. I know that folks have different feelings about going to visit the gravesite of their loved ones. I have known of folks that went and sat at the grave many afternoons and found great comfort in doing so. I do not see myself doing that, but I will go as I want to and I imagine it will be a time of reflection for me. Reflecting upon the person she was the influence she had on my life and continues to have. 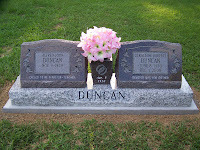 I am so glad that Dad and Mom had discussed where they would like to be buried before Mom’s death. I didn’t even know that they had discussed it. They had ridden out to Mer Rouge Cemetary a couple of years ago and decided that they really liked the location. It is on the top of what is known as Red Hill. It is very quaint, out of site, and quiet. One can go to visit and likely will never be bothered by anyone else being there. Tommy and I liked the spot so well that we have bought the plots beside Dad and Mom’s for our final resting place. On a lighter note, we’re off to Ok. In the morning and will return on Sunday with Clancy and Bridget in tow. We look forward to having them here for several days.